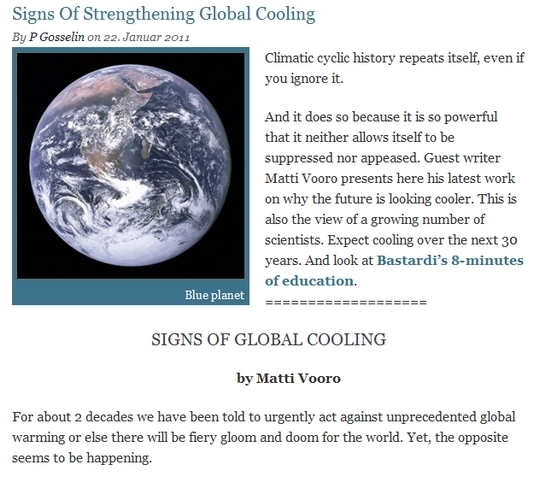 THE DEMISE OF SUNSPOTS—DEEP COOLING AHEAD? The last time sunspots vanished from the sun for decades was during the Maunder Minimum from 1645 to 1700 AD was marked by drastic cooling of the climate and the maximum cold of the Little Ice Age. Two hundred years ago, Charles Lyell coined the phrase “The present is the key to the past.” In today’s highly contentious issues of global climate change, we might well add “The past is the key to the future, i.e., to forecast future geologic events, we must understand past climate changes. This paper documents past global climate changes in the geologic and historic past. Recent laser imaging of the Earth’s surface provides new evidence for abrupt, fluctuating, warm and cool climatic episodes that could not have been caused by changes in atmospheric CO2.